Started this chapter in Nov 2011, it’s quite a weird feeling to see it finished. Chapter 5! of The Meek will start in mid-March… we haven’t seen the deSadar family in a while, but believe me they have been keeping busy. In the meantime Mare Internum will continue updating frequently. We’ve reached the 12x updates per month tier on Patreon so there are quite a few pages on the horizon. Thank you all so much for supporting my work and for reading, I couldn’t have done it without you. See you in March! I just about finished College back then and moved out to live on my own. Took me three years to get accepted at the art academy and I’m now in the 3rd year of that. Wow. Yeah, it’s crazy. My job, living location, relationship, life, etc is completely different now than it was when I started this chapter. It’s amazing how long I’ve been following the comic. I know (vaguely) that you’ve been through a lot. Keep up the good work. Hello, new friends who… have his backpack and the trident. I wonder if they killed the two others. Gah! I didn’t even notice them at first!!! Thanks for pointing out that those guys are carrying Tanome’s weapon. I just thought pitchforks were a thing here. Like Darko said, if you look close you can see Pinter’s pack too :[__] Nice of them to bring it for him. Wow this chapter pretty much took me through my entire college career! building sandcastles in my heart just to smash them up. Oh good, those Korok will help! Awesome work on the finished chapter; it was well worth the wait! This is one of my favourite webcomics! I was so happy when it came back, and I’m so glad that you were willing to go to the effort of finishing this chapter! I love the use of simple imagery and framing in these last two pages: the sun coming up to reflect the emotional relief, and the last panel in this page-it may be a hunch, but I suspect you deliberately framed the mysterious figures to the side like that in order to show them as non-threatening characters. I really hope they are; Angora and Pinter could use a break. But now I am guessing it will be about a year or so before we see what happens to Angora and Pinter next, right? From the references Der-Shing made to chapters 7 and 10, it is obvious that the three story lines obviously won’t be merging any time soon. Well, I can’t answer that question directly ofc but I will say that I’m reducing the story (like, in the sense of reducing sauce… I guess that means condensing lol) quite a bit. A lot of Chapter 7’s content has been merged into 4, and the new 7 will be a mix of 7 and more heavily, 10. I’d like the story to be a little more dense and faster paced not just for the excitement level but also because I would very much like to finish within my lifetime. It seems a good idea. And we thank you a lot for that ! Shingworks: …but also because I would very much like to finish within my lifetime. I used to read Poison Elves. So I fully understand the sentiment. Cool comic, sad the author died before finishing that very long series. And Matt Wagner’s Mage series which so far he has published two big books in his trilogy. But I also used to read Transmetropolitan and Dave Sim’s Cerebus which are epics that are finished. … so I can see epic length comics are still a good thing. Yay chapter 4 completion! Excited to see where we go next. As much as I enjoy the time spent with Pinter and Angora, there are other characters I hope we catch up with soon, like Luca, Suda, and Rana. I had forgotten. Now I’m bracing for the disappointment of more waiting to learn what’s up with Luca and the kids against the excitement of meeting entirely new characters. Evil, evil, evil. I didn’t think this chapter would finish. There were times that I made it kind of a joke to check back here from time to time during the hiatus, and there were times I’d actually lost hope on this great series resuming, but here it is, wrapping up another great chapter! Kinda feels like a milestone for me in a way, seeing as I’ve been following this comic since my High School days; And seeing this return gives me good ol’ fit of nostalgia! Thank You for all your hard work over the years, I patiently wait for your future entries! Whelp that actually ended on a good note. Despite the possibly bad situation with the new fellows.. Though she uses her powers the best when she’s panicing. oh. also terrribly curious why they have their gear..
and what that means about the two other folks back there. Add a mystical beanie-type directional attachment to his skullcap and who NEEDS a map? Angora used INEXPLICABLE NATURE HEAL! Pinter(‘s hat) has evolved into POINTER! WOOO! AWESOME. I’ll join the bandwagon and say: I was on my first year of college when chapter 4 started, and now I’m about to start thesis work. Congrats on never giving up! yay chapter four is finished! i was in eighth grade when this chapter started. everything happens so much. I just re-read the chapter on a whole and marveled on the writing. All those witty little remarks that only pop up truly during a 2nd reading, or when you read it on the whole (and I love stories worth to be read twice). Focus on the things in front of you (Etan) and you’ll be fine. HOLY man! plus all the more subtle stuff in the dialog between Pinter and Angora. I’m so glad that this comic is still going. I read it all the time back when you first started, and kept it in my bookmarks for a long, long time since. I’d check back again and again and again, only to see the same Hiatus message. It was awful. Years passed. Then I removed the bookmark. Then, one day on a whim, I was like “Hey, what if The Meek were somehow resurrected? Let me google that, even though I already KNOW it hasn’t, and- wait a second, this isn’t the same page. This is a NEW PAGE! How long has- oh, it’s just this one.” I just happened to check back right after you began going again. And I’ve been checking in every single day since. Keep it going, brother. Keep it right on going. Hey more then slightly sinister grass-puff men. Oh god, it took me a second look to see the figures in the BG – I just about had a heart attack. Congratulations on completing this immense chapter! I can’t wait to see what’s happened with the deSadars, but I’m so looking forward to some more MI in the meantime. I wasn’t in school when The Meek began, but I was an aspiring webcomic creator – Just recently ticked that off the list. You’ve been such an inspiration throughout the years! Congrats on starting your own comic! It’s like having a baby; you’ll lose sleep and money and never have any free time to yourself ever again, haha. Hah! Well put, I’m learning as much. Loving it, though. I’ll take these art babies over meat babies any day. ‘Still here’ dependent on receiving healing in time to halt internal rupturing before incurring irreversible damages. LOL. 100000 points for the Nichijou reference. Can’t wait to see what Luca and his brood are up to. I noticed that too. I bet those small grass men revere her as a goddess considering how that one lifted its arms the one time it saw her- and considering they probably have been spying on her and the other guys this entire time. Good- puff grass men? Coming to help them grass puff men? I do believe I see one of the grass pufff men holding a bag, that might have a map in it… Could be the Trident the other one is holding is the very one that injured Pinter in the first place? Congratulations on finishing the chapter, der-shing. I’m glad to see that the hiatus, as well as other things, haven’t stopped you from doing what you enjoy. Damn, I remember when this chapter started. I was in high school. Congratulations on surviving life long enough to finish it. All these years later, it’s still the best webcomic I’ve ever read, and I’m glad I stuck with it. Congratulations! I’ve started reading your comic in the middle of art school and now I’m working in animation! Really crazy! Anyway, does this mean that you’ll make a printed book out of your comic? I would totally buy it! I love this story SO much, and am so entirely happy that I found it the DAY you broke hiatus (which in it’s self was an entire other level of awesome). Got to say for a long time I thought this comic was dead… damn glad it’s not. I know a lot of people are saying college but I was in Jr. High when I first discovered this and June I graduate High School… it’s been a damn good time! Looking forward to the upcoming chapters now excuse me while I reread 2 and 3. Long-time reader, first time commenter. I just wanted to say congrats on finishing the chapter, love your work and story, and thank you for being an inspiration in keeping your comic going NO MATTER WHAT may come. As a fellow webcomic artist/writer, you remind me what true passion, perseverance and dedication are. Congrats! 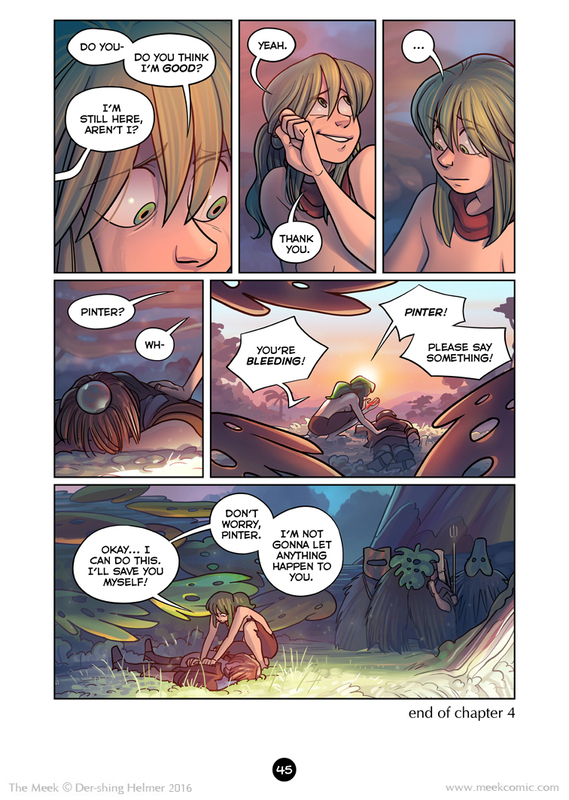 The Meek was the forst highquality Webcomic I found. Time did good for the Webcomic landscape and I will reap as much as I can. Just realised I was not jeating impaired at the start of the chapter…. has ot really been that long? crazy. Congratulations! I’m so happy for you, Der-Shing. Like someone else said, The Meek was one of the first really good webcomics I stumbled upon. It will probably always be my favorite. You and Ashley Cope have been huge inspirations to me as a doodler and aspiring comic maker. Thanks for all your wonderful work. I JUST DISCOVERED THAT THIS COMIC UPDATED FROM 2012!!!!!!!!!!¡¡!!! I was kind of hoping we would be returning to Soli and Alamand, but then I saw your details of Luca and the kiddies, and I couldn’t help but “squeee!” a little. I remember when I was reading this chapter back in high school and now I’m graduating from animation- partially because of this webcomic and your work. It means a lot to see you working on it again. Can’t wait to read more! What i’m doing here? It took me two days to read the whole comic. Three storys, right? First one, Pinter is dying; second one, our beloved queen is dead; third… you know how it end. What are those guys in the back?